Posted on November 18, 2015 by Appropos / This entry was posted in Informative and tagged glass, pipe, pipes, smoke shop, smoking. Bookmark the permalink. At Sunflower Pipes we often get the question, “Why are glass pipes better than other smoking pipes?” Regular smoking pipes, ones made out of materials such as metal or wood, have traditionally been used for smoking but they are not always the best option; here are some reasons why. When people think of glass they think of something that can break easily when dropped but with glass smoking pipes that is usually not the case. Glass pipes are usually hand blown from borosilicate or Pyrex glass, this is the same type of glass used to make glass baking dishes or bowls, it is nearly unbreakable. A good glass pipe will survive repeated falls on surfaces like wood or linoleum, even if dropped from a considerable height. Some surfaces will break a glass pipe no matter how strong the pipe might be. Surfaces such as a glass table or a tile floor will usually break even the toughest pipe; the reason is that these surfaces are harder and denser than the glass pipe itself. When deciding how strong a glass smoking pipe is, thickness is the first factor most people consider. For instance, you can drop a thick marble on a tile floor and it will be unlikely to break. Many glass pipes are referred to as “double blown” or “triple blown” or “inside out”. These terms are meant to denote thickness and quality; it does not mean they were literally “double” or “triple” blown. Saying a pipe is inside out or double blown is basically the same thing. When glass pipes are formed, the color is often added to the molten glass bubble and then the bubble is forced inside out so that the color is trapped inside the glass in such a way that the color details are 3d to the eye. Single blown pipes are usually thinner and only feature color 2 dimensionally on the surface of the glass. Though single blown pipes are often thinner they to can be quite thick if the blower so chooses. As you can imagine, thin glass pipes can break quite easily when dropped. A really thin glass pipe can even break when heated. Really cheap pipes also have a tendency to break. There are a couple of reasons for this. One reason cheap glass pipes break is because of the lower quality of glass, the bigger reason is that when people in China or India are blowing cheap pipes they do so as quickly as possible to save money. In doing so they do not take the extra step of curing the glass pipe in an oven. The process of curing takes a few hours but the end result is a tempered, much stronger pipe. If a glass piece is not properly cured it will crack or shatter very easily. Don’t be fooled by the cheap pipes. A good glass pipe can easily last for years. One big advantage of hand blown glass pipes is cleaning. A glass pipe can be easily cleaned using a commercial solution such as 420 cleaner. 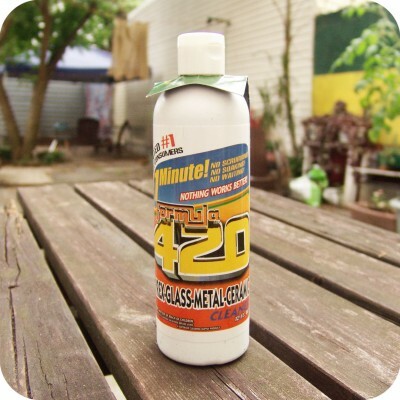 420 cleaner is a mix of cleaning solvents with added abrasive materials you can soak the glass bowl in 420 cleaner or you can put some cleaner inside the pipe and shake it vigorously to clean it. You can also clean a glass pipe by using isopropyl alcohol. If you prefer using alcohol then the best way is put the pipe in a bag and shake it with alcohol and sea salt or sand, then finish cleaning with pipe cleaners. You can soak the glass tobacco pipe for a period of time, although if you soak the piece to long it can take out the fuming on the inside of the glass causing it to loose some of its color. Another way to clean a glass piece with alcohol is to put the pipe into alcohol and then microwave it for a few seconds to get the alcohol hot, the end result will be a super clean pipe and it only takes seconds this method can also take out some of the fuming especially on cheaper pipes. on cheaper. Be careful though heating alcohol can be very dangerous (don’t try this at home) also using alcohol on a pipe can take out some of the “fuming” or inner color. The reason glass is superior to other materials when cleaning is that the process is easy, quick and does not diminish the functionality of the pipe over time. Wooden and metal smoking pipes have to be scrapped, this is a messy, time consuming process that can leave your hands covered with a smelly tar; also the scrapping scratches and damages the wood and metal which in time can render the pipe useless. Another concern people have about glass smoking pipes is, do they heat up? Like wooden smoking pipes, glass pipes do not conduct heat. Wherever the flame is applied to a glass pipe it can get super hot, but that heat will not spread throughout the glass piece and will remain localized. Metal smoking pipes however have the disadvantage of becoming very hot after continual use and can even become too hot to hold comfortably. With metal, the heat from the point of contact with the flame is transferred throughout the pipe causing very uncomfortable drags and sometimes requiring a break time for cooling to occur and the pipe to become useable again. You can pass around a glass pipe all day and you will not encounter the same problem. When it comes to look and feel, glass smoking pipes really out shine metal and wooden pipes. With metal and wood smoking pipes the only way to add color is with paint. Glass smoking pipes on the other hand are colored using color rods. Color rods are used in a similar way that pieces of a stain glass are used to make a window. The rod is its own color glass that is then integrated into pipe intact and adding to the whole. The quality of the color rods is very important with a more expensive quality rod the color is incredibly vibrant with cheaper glass rods the colors can be muted or muddled, like the depressing orange used in the cheap glass pipes you find in low end smoke shops and convenience stores. Another way color is added to glass pipes is through a process of fuming where gold or silver are held in front of a torch so that the inside of the pipe is coated with the material. This process of fuming means that the pipe will change color of many uses. Pipes fumed with silver will start to reveal a wide variety of iridescent blues and glass fumed with gold will yield a striking array of pinks and purples. The best advantage of glass smoking pipes over other smoking pipes is the flavor. Wooden pipes can put off a nice flavor after they are cured properly but over time the sides can become burned giving off a charred after taste. Metal smoking pipes almost always give off a metallic unpleasant flavor especially in the case of cigarette bats like the ones used in dugouts. Glass pipes have none of these drawbacks because they hit nice and clean every time. The glass itself gives of no flavor since it releases no fumes when burned at low temperatures, like those created by a cigarette lighter. A glass smoking pipe can give off some flavor if the bowl is covered by resin since the resin itself does burn, but this problem can be easily eliminated by cleaning by wiping the bowl with a paper towel soaked with a little alcohol. There are a lot of people holding on to their old metal or even old corncob pipes. Smoking is about enjoying yourself don’t make the mistake of resigning yourself to a smoking device that is not as pleasant as it could be. Maybe you have had that pipe since college and you are attached to it. Fine; frame it and put it on your mantle so you can cherish it forever and then go out and buy a nice piece of glass, if its the price that bothers you remember you will potentially be spending thousands of dollars to fill the pipe and the added price is ultimately going to be pennies per bowl. Even if you only smoke from time to time those times are special and having a good pipe will make them more so. One Response to Toss That Old Metal Pipe, Glass Pipes are Better!